August 29, 2013 September 1, 2013 by Beau H.
If you’re searching for a slightly dressier alternative to a polo, the good news is, there are several places you can turn. The key with making the jump up from a polo is to not overdo it, and to pick the right time and place. Wearing a blue Oxford cloth button-down is absolutely a great step up from a polo; the texture is a bit more visually interesting, and if you like, it can be dressed up a bit more. The potential for the blue OCBD is practically limitless as far as pairing with other neutral, well-fitting items in your wardrobe. Namely, the OCBD as a style staple has been worn in just about every way imaginable. It’s become standard business-casual dress for a lot of workers across the country, but there’s a difference between wearing one for the sake of wearing it, and wearing it the right way. 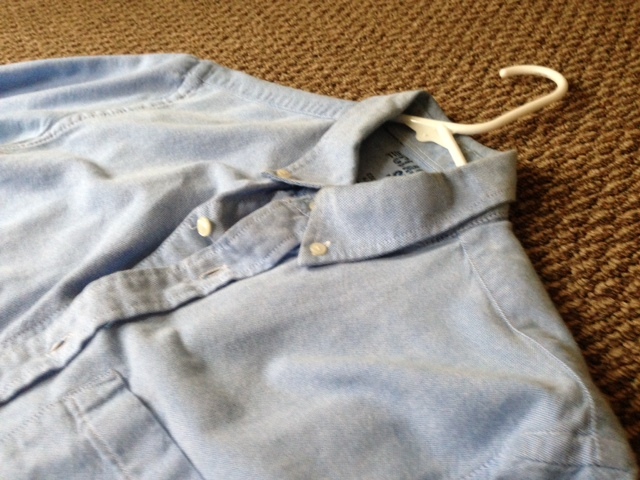 The right blue OCBD fits trim through the body, has decently high armholes, and trim sleeves. Make sure it fits across the shoulders (doesn’t pull or tug when you move) is the first step, because a good tailor can always dial in the rest of the body. Once you’ve tracked down one at the right price, it can function in many of the same ways as the polo. 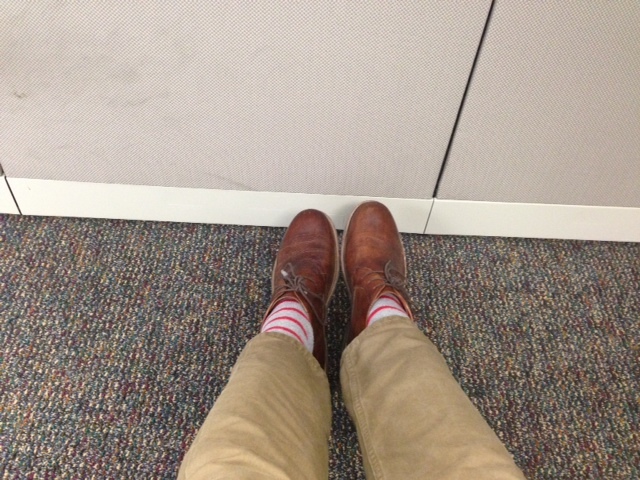 To stray away from a standard business casual look, avoid pairing it with khaki chinos. 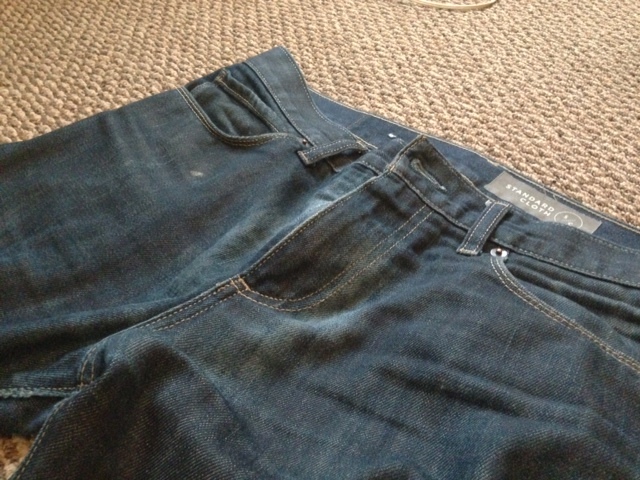 Shoot instead for a pant with a more dusty or visually appealing color. Try and keep the fit slim, as well — a Levi’s 514 is a standard fit for many who have more leg muscle, but a 513 or a 511 (which you might already have in your closet), will keep the outfit on-point and trim. And when it comes to the belt, have fun with texture — a braided belt grounds the look more casually, as well. If you’d rather not wear brighter chinos or pants, dark denim is absolutely the way to go. This might be repetitive to some, but the key with so many of these Style Essentials isn’t that they’re ground breaking or incredibly fashion-forward; the biggest key is that they work time and again in nearly any situation, helping you save money and fall into a trap of ‘too-fast’ fashion. As long as the basics fit well, other areas, like accessories, socks and watch straps, are ways to inject some personality into an outfit. Dark denim paired with another shade of blue, the OCBD. 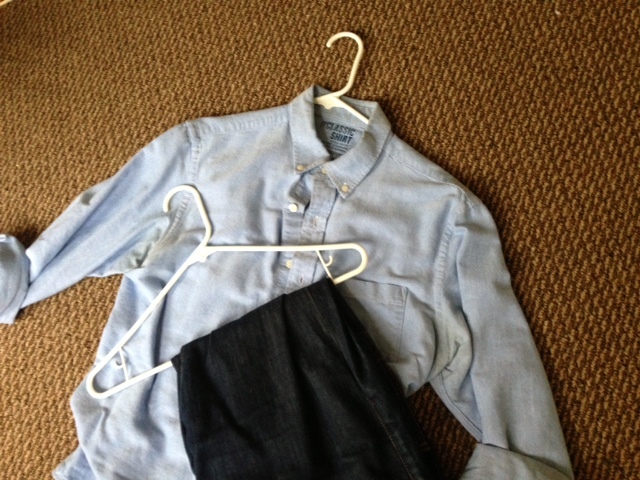 Now, back to the pants — slim, dark denim actually works very nicely with different shades of blue. Putting multiple shades together doesn’t inherently create a jarring clash, as Joe from Dappered notes here. In fact, the contrast between those shades is a good thing! For other outfit ideas, throw on a navy blazer with that blue OCBD — once again, those shades of blue actually play well with each other. Additionally, v-neck sweaters can be a great layering piece once it gets cold. A rotation of different colors (like black, tan, or heather gray) could keep you in outfits for days, if not weeks. If shorts are more your thing, look for a pair in a khaki or tan-colored shade, which plays off the blue nicely. And feel free to tuck that OCBD into the polo — it’s a way of polishing off the outfit. Again, that braided belt adds some nice visual interest, too. It’s worth noting that the blue OCBD is only one alternative to a polo. Other solid-colored sport shirts, like a white OCBD, can be rotated in and out of each of these looks for something sporty or slightly more business casual. Start out by reaching for one of these shirts, and you’ll soon start to develop a rotation of solid “mini-uniforms” you can go to time and again. 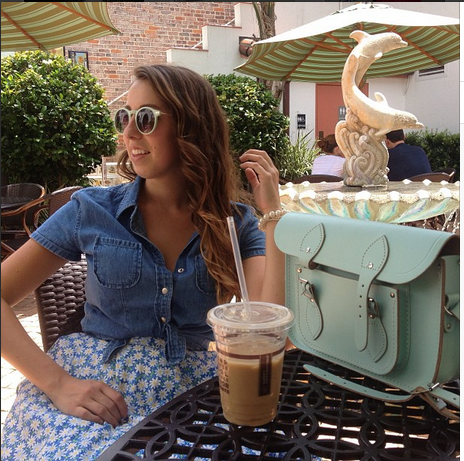 August 22, 2013 by Beau H.
Walking around campus or to and from your job requires more than just a plain bag — you need something eye-catching, functional and fashionable. Something lasting and timeless is great, too! Whether you are going back to high school, college, or even entering the workforce, The Cambridge Satchel Company has a bag for you! They have so many different sizes, styles, and colors, you are sure to find exactly what you need. I have been a huge fan of the company since I discovered them in the spring of 2012. 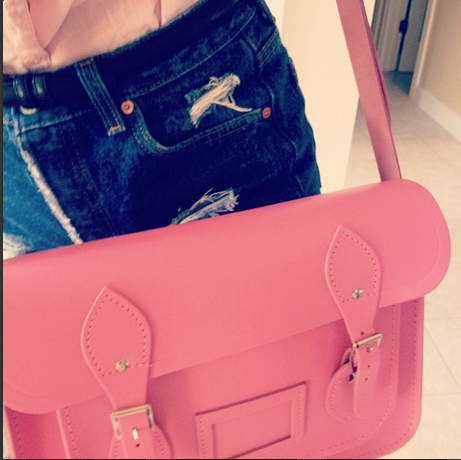 I used my first summer paycheck to purchase one of their classic 13-inch bags in pink. The 13-inch is the perfect size for all of my daily necessities and it functions well as my carry on purse when traveling. These bags are so structured and well-made-I’ve been using mine for over a year and it is still in perfect condition! I also have the 11-inch satchel in Sweet Pea. This color is absolutely beautiful! With this picture I won Pic of the Week and I was featured on The Cambridge Satchel Company’s blog and social media outlets! The 11-inch is great if you don’t have many things to haul around with you. Tucking the shoulder strap inside the purse turns it into an adorable clutch for night! The backpack is a great option for students who need to carry their laptop and notebooks to class. Their color options (red or brown) are traditional fall colors that will also carry over nicely to winter and spring. The Music Bag or Batchel options are perfect if you are in the workforce. They are larger sizes that offer more space for paperwork, supplies and other necessities. Although the bags are a bit pricey, I can assure you they are worth the price. They are versatile, durable, and timeless. They are a perfect gift idea, and you can even get your initials embossed on the front flap. 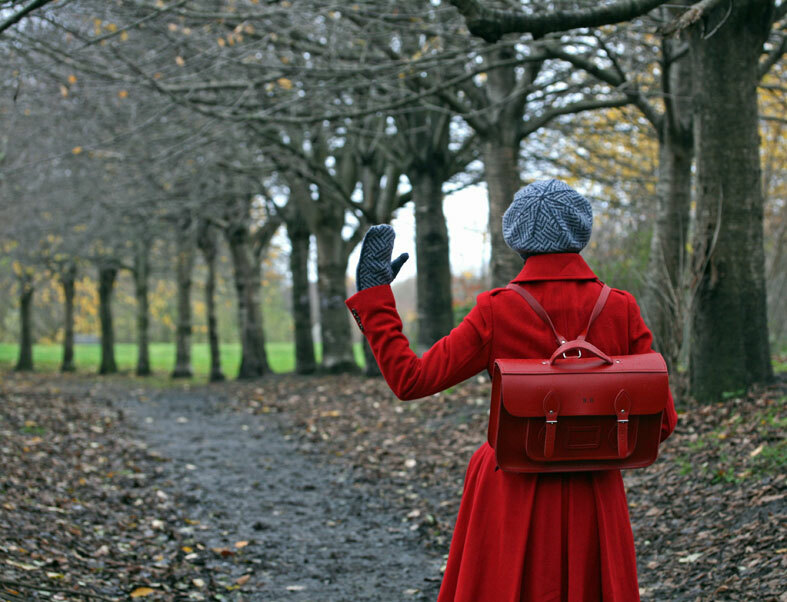 The Cambridge Satchel Company offers so many colors to choose from. If you are willing to sacrifice some quality for a lower price, they have a clearance section featuring bags that have slight cosmetic flaws for a huge discount. I am absolutely obsessed with these bags and they are a staple fall essential no matter your age! August 20, 2013 August 20, 2013 by Beau H.
Putting together outfits is a complicated dance between coordinating what you have on your feet, to what you’re wearing on your legs, to what you’re wearing up top — all while keeping fit and situational awareness in mind. If you abide by the idea of a personal uniform, an outfit that you love to wear (and one that looks great on you), it makes picking out what to wear a breeze…almost. Sticking with well-fitting classics can be a great way to develop said uniform — this look, whatever that might be, is something you would feel comfortable throwing on day after day, with different variations of color and in different settings, ideally. Starting that process out with a clean, simple white polo can be a terrific foundation from which to build outfits and eventually experiment with more color. As it’s primarily a warm-weather option, it may not work for as many months of the year as it would for those of us in different, more temperate climates. But when it does warm up, here’s yet another option for casual wear. If you’re in college, a white polo (or really, any polo) can be a nice, simple step to take away from the typical graphic t-shirt or plain shirt it seems so many guys wear. And many options are available at outstanding prices; Old Navy, for one, offers tremendous deals. But in terms of color, white is only a starting point; other color polos (when paired with neutral shorts, for example), achieve the same effect as a white polo. When it comes to versatility (and if you’d like to experiment with ‘loud’ shorts or an eye-catching watch strap), white is definitely one way to go. Navy is a great starting point, too, as it pairs with several different outfits and works in nearly identical settings as a white polo. Putting on a collared shirt where you would typically wear a t-shirt (say, to the grocery store, for example) is more crisp and put-together looking; it can easily turn into something you do on a daily basis. And for the day-to-day college student, a polo is easy and simple; it dresses you up just enough without going into full-on suit territory. The right white polo would pair with jeans off-duty, with rolled chinos and loafers for casual wear, or with shorts for a hot trek across campus. And with desert boots and dark jeans, you have a solid foundation to throw in some pops of color with crazy socks or a bright watch strap. The perfect template for a casual outfit, if there ever was one. A white polo lets you mix in other colors without overdoing it. Shorts by J. Crew. On another note, a polo is polished without going too far over the ‘over-dressed’ line. If you’re looking to make small, easy upgrades, swapping that graphic t-shirt out for a polo makes a lot of sense. Wearing better clothing, clothing that fits, helps you feel better, too; increased confidence translates to better grades, better work performance…you name it, well-fitting clothing can help you achieve it. Outside of the classroom, even in a business casual setting, nailing the fit of the polo is something that can help you stand out in the right way. 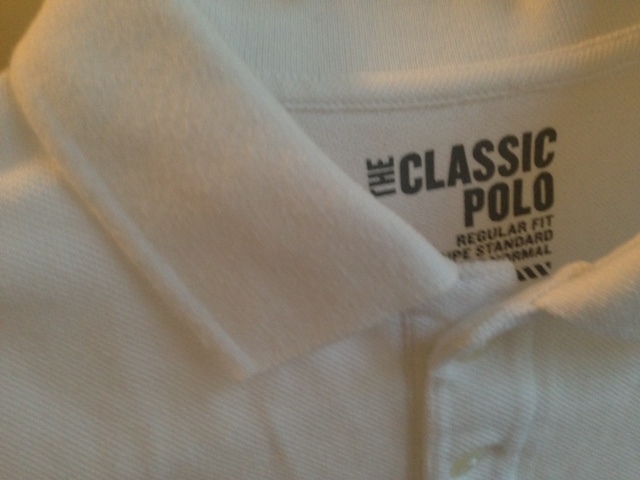 The ideal polo should fit trim through the body, with sleeves that hit about mid-bicep. Some polos, like the option pictured from Old Navy, have a bit of a longer back tail, which makes it tougher to wear untucked. Ideally, the polo should be fitted enough to wear either tucked in or untucked. J. Crew’s slub polos seem to hit the sweet spot on a personal note, as do options from Sunspel (although those are a bit on the pricey side; be warned). When it comes to fabric, the slub fabric and its texture are less dressy than a pique polo’s closer weave, but either option would do fine in a college campus or business casual setting, especially in a crisp, white color. 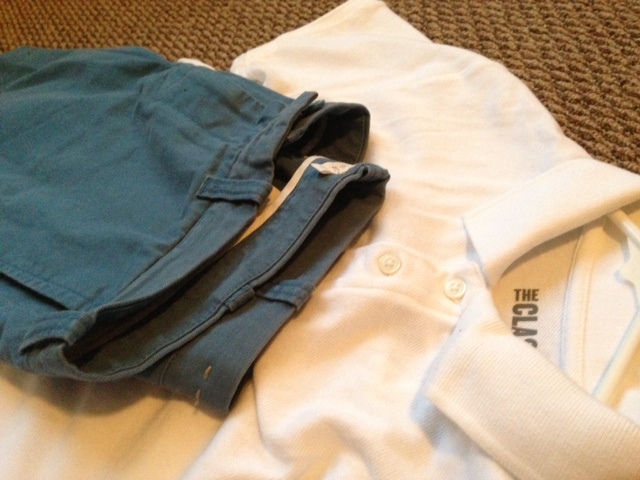 Using the white polo as a blank palette to build in other colors is a tremendous way to upgrade an outfit, too. White polo with red shorts? Sure, that works. As do blue shorts. And just about any other color you can think of. Dialing down the loudness of your shoes by wearing a clean, simple plimsoll or canvas sneaker accentuates your shorts or other colors in your outfit. For versatility, a white polo hits the nail on the head. It can be matched with any other color, it can pair with jeans, chinos or shorts, and it can dress you up the right way for class, a date or a casual day at the office. It can be layered under a v-neck sweater during the cold months just as you would layer an OCBD, too (check out option #5 on this post for ways to wear a polo in cold weather). It may be basic, but by combining a simple polo with other colors, you can get more wear out of one garment than any other in your closet. August 14, 2013 September 27, 2013 by Beau H.
Shoes are absolutely a foundation of any outfit. The entire tone of an ensemble can be set by what you wear on your feet. A nice pair of shoes can elevate a look from casual to dressy, or (with the wrong pair), serve to undermine the work you put into the rest of your look. In an ideal situation, they can provide an extremely solid starting point from which to build multiple outfits or looks. A good pair naturally lends itself to versatility — the right one can go with chinos and jeans, as well as dress trousers. Remember dark denim? Well, those jeans (along with chinos and some trousers) have met their match. In that arena, there are few pairs more classically timeless (yet current) as the desert boot. A rather non-descript shoe with no-fuss eyelets and open chukka lacing, the desert boot has served as a style staple for decades, but has been enjoying a resurgence of sorts for the past few years. That’s partly because of their understated look, as well as their versatility and variety of of color options. However, typical desert boots are available in muted colors, and a good amount of time they come waxed, with a crepe sole. Although the sole isn’t the most durable with frequent wear on city streets (hence the term desert boot), the style should serve well in a weekly shoe rotation. For starters, Clarks makes some of the best desert boots on the market at relatively affordable price points. In fact, the brand is one of the few that’s become synonymous with offering a single product, and offering it at consistently high levels of quality, for years on end. If you’re starting out with a pair of desert boots, you can’t beat Clarks. 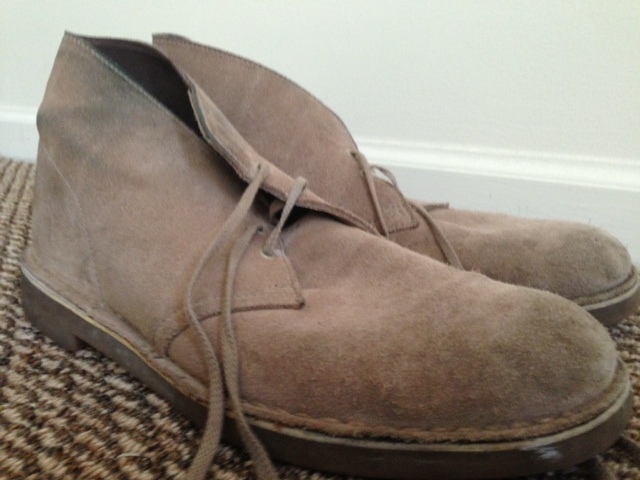 Old reliable tan suede desert boots by Clarks. Beat-up, but durable. Dress-style desert or chukka boots are now widely available, too. Ideal for sprinting around a city or adding some visual interest to a well-tailored suit, boots with that type of open lacing are inherently more casual, but can definitely be dressed up. There are other benefits, too. The boot’s higher-ankle cut can help create a clean line between the break of your pants or suit trousers and the tops of your shoes; paired with a Levi’s 511, 513 or 514 jean or chino, the desert boot creates a slim silhouette that honestly flatters a good deal of body types. Dress-style boot option by Steve Madden. 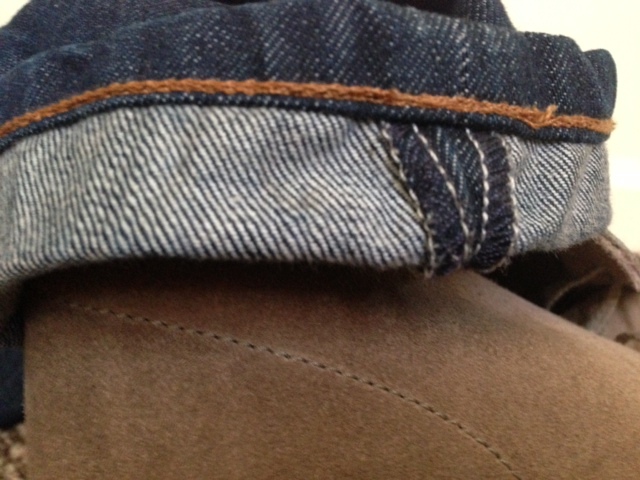 With Levi’s 511 tan twill chinos. And the desert boot pairs extremely, extremely well with the right pair of dark denim, or with tan twill chinos (as shown above — that subtle burnishing contrasts nicely with the faded, dusty-looking chino). With denim, take a selvedge pair for a spin with some Clarks; the two seem tailor-made for each other. When it comes to pairing other layers atop those two, brown leather or tan suede desert boots wouldn’t look out of place with some dark denim, a navy blazer, and an Oxford shirt. Rotating out the blazer for a v-neck sweater dresses down the outfit while still keeping the look cold-weather ready. For other options, it’s hard to beat a pocket tee or short-sleeve henley, still building off that “desert boots and dark denim” base. Throwing in a pop of color in the form of a slim polo or T-shirt does the job nicely, too. A closer look at cuffed pair of denim atop the classic desert boot. Once you wear those shoes, though, (and even before that), keeping them fresh out of the box is huge to prolonging their life. For just under $10, Kiwi Suede Protector goes a long way toward keeping those shoes safe from Mother Nature. And as with any item, care is one of the biggest keys to ensuring you look your best. And keeping the pair clean actually expands the number of outfits you can wear them with; a cleaner boot works with everything from dressier, navy chinos to jeans. So, going from the ground up, jeans and desert boots are about as versatile as you can get. Keeping everything affordable by using websites like Amazon and keeping things clean using a nice suede protector ties the entire ensemble together in terms of affordability and flexibility. Pairing desert boots with other, classic items (like a slim polo or Oxford shirt) only adds to their appeal — finding pieces you love after a long search can be just as rewarding, something you’ll be reminded of every time you slip them on. August 12, 2013 by Beau H.
There are only a few weeks left of summer time, which means you only have a few weeks to test out some of the hottest trends. Whether you are headed to a music festival or just out and about, flower crowns are the perfect addition to an outfit. These crowns are so easy to DIY! Pick a few flowers from your yard or go to your local crafting store for a longer lasting option! These crowns add a feminine touch, as well as boho look, to any outfit. 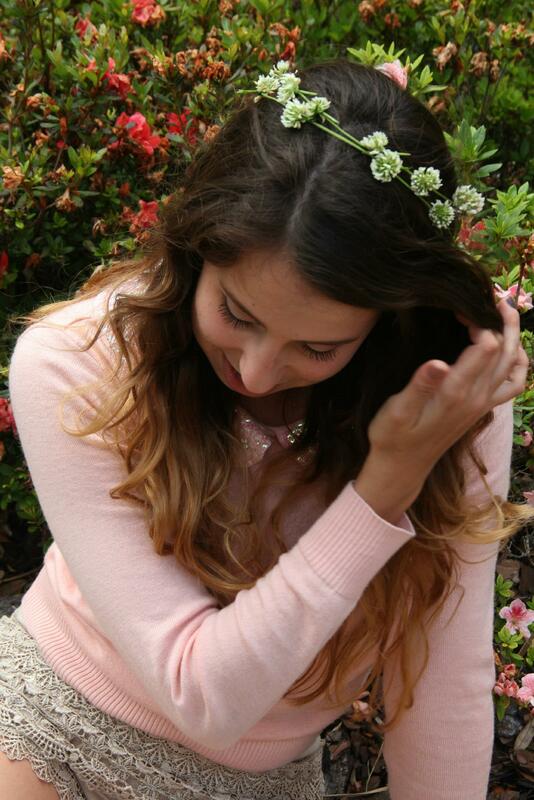 For a subtle look, use small flowers or if you are feeling bold, go over the top and make a Lana Del Rey-style crown! My take on a simple crown! These crowns look even better paired with a sheer Kimono. These kimonos have been in style for a few years now, but the look is still hot! Again, they add a boho element to your outfit and pull everything together. These are fairly easy to DIY as well (check out this ThreadBanger how-to on youtube!). Look in your local thrift store (I’ve seen quite a few bathrobes that could be upcycled into summery kimonos) or Etsy.com if you aren’t into DIY-ing. Pair both of these trendy items with a pair of high waisted shorts for a simple look, or a maxi skirt to go all out boho! However you style them, you are sure to look and feel like a summer stunner! Check out these looks on Lookbook.nu for some inspiration! Harvest Moon by Jennifer W.
Summertime Happiness by Piret P.
K I M O N O by Laura V.
August 6, 2013 August 6, 2013 by Beau H.
Most guys would probably do just about anything besides shop. You name it, it probably trumps shopping. So naturally, this first post is about shopping, or rather, what should be hanging in your closet. And on your legs. There are actually a myriad of reasons why guys should take an active interest in clothing. From improved confidence to better overall attentiveness and performance (particularly in college), the benefits are certainly noticeable. Plenty already adhere to that thinking, but for everyone else, it’s become a lot easier to improve the way you dress just by using the Internet. The explosion of the Web has made #menswear more accessible than ever. It’s also made it more confusing to follow rules and stick to fundamentals in a barrage of trends. The biggest key with trends is to know what works for you, in what situation. That’s another matter entirely. First things first, though. It helps that there are items that can help ease the confusion of shopping. Items that most anyone can turn to, in nearly any situation, and dress up (or down) with relative ease. These items, one might say, are Style Essentials. Every guy should own them, every guy should wear them. Most of the time, they’ll work wherever you want to go, in nearly any situation. And the little details or improvements that come from changing one individual piece at a time (or simply wearing more of an item that you already have) add up to a much better overall picture. These aren’t expert tips or rules by any means, just a take on what can probably help most guys improve (or change) about their style. There’s a good chance many already have mastered these fundamentals. If so, good for you … and maybe you need a refresher? Either way, let’s start with your pants. Specifically, something that could help you wear better pants. Or just more of the same type of pant. Ultimately, these are only guidelines or suggestions to be followed … if you feel like it, that is. Standard Cloth jeans by Urban Outfitters. Distressing by Michigan fall and winter. If I had to pick one item from my own closet that I couldn’t live without, it would be a pair of dark jeans from Standard Cloth. Available at Urban Outfitters, they’re a pretty solid template for a basic jean. They’re slim (just like the ideal pair of jeans), they have a tapered cut to the ankle (a matter of personal preference), and at purchase, they were a perfect, inky blue color. The inky blue creates a uniform visual appearance throughout, although these have since been beat-up quite a bit. Jeans in a darker color, overall, look much more polished and are much more versatile than the average pre-distressed pair. That doesn’t mean lighter-wash jeans are bad, because you probably need a pair of those too. And plenty of people love light-wash jeans — I have a pair in the closet, myself. However, they’re just not as versatile or polished (well-suited in terms of color and weight for the warmer months in particular, to be sure, but not as versatile). Dark jeans, on the other hand, can be dressed up with a slim polo or a v-neck sweater, and stand out from a standard pair of pre-distressed denim in all the right ways. Unlike pre-distressed denim, dark jeans pair more closely with desert boots or clean, canvas sneakers. They work with a slim dress shirt, knit tie and desert boots or brogues as well as a pocket T-shirt. They can be worn in virtually all seasons, every day. Besides a nice pair of suit trousers or some casual chinos in a season-specific color, nothing can beat slim, dark denim. 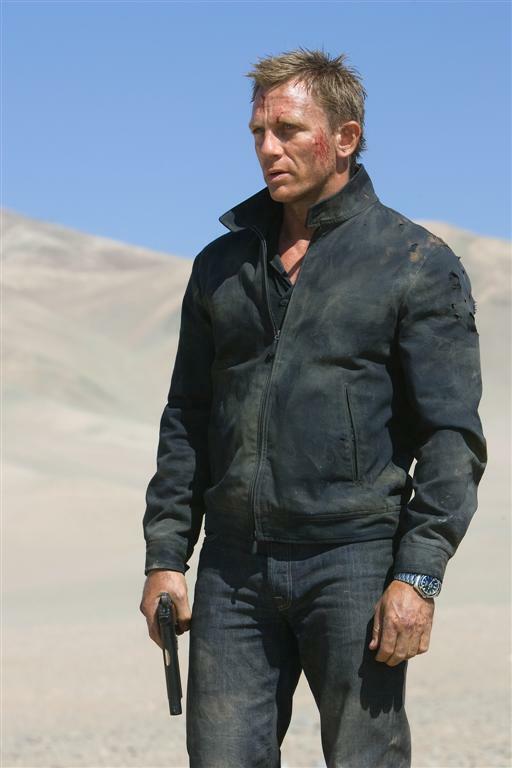 Heck, even James Bond wears denim. (Situationally appropriate handgun not included). 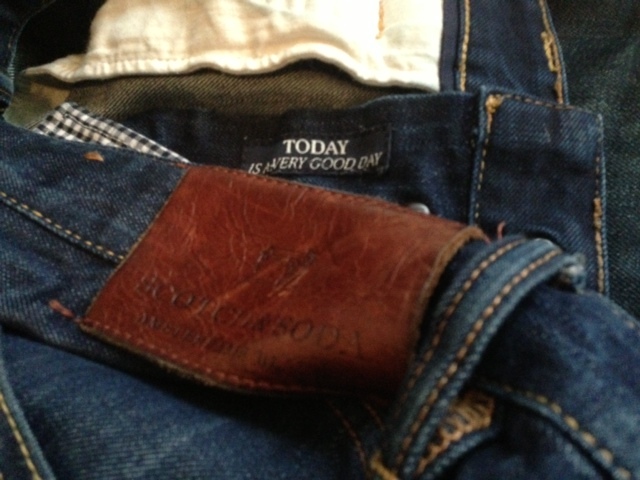 Any day wearing dark denim (here, by Scotch & Soda) is indeed a good day. If you’ve got the right pair in mind, at the right price (Macy’s and JC Penney sell classic, dark Levi’s jeans for low, low prices) , the right cut — either a slim or slim-straight cut — is key. It can make or break the jeans. A slimmer cut creates a much more flattering silhouette than a baggy relaxed fit, or even a baggy or regular straight cut-jean. Try it sometime; there’s few people who will look bad with less fabric hanging around the ankles. A jean with a slight bootcut can work if you’re taller and larger because it evens out body proportions, but the fact that these jeans are still available off the rack at most major retailers doesn’t mean they’re necessarily “in,” and it doesn’t mean you should buy them if you’re particularly slim — they just won’t look as flattering as a leaner silhouette. And once you have those jeans, there’s little they won’t go with. Charcoal polo? Wear those jeans. Pocket tee? Throw ’em on. Long-sleeve t-shirt on a casual day? Yes, of course. They could turn into the most important item you own, because the foundation of a guy’s wardrobe starts at the bottom (more on shoes later). Most importantly, there’s nothing too outrageous-looking about a simple pair of jeans. Black-tie ready? No. Groundbreaking or fashion-forward? Certainly not. But there’s little that can be said against pairing those jeans with something simple, day after day. There’s also something to be said for creating a personal uniform, and jeans can be a great way to start. In fact, one could say owning a good pair of jeans is… essential.